As a member of DDSC you qualify for an exclusive 10% discount off all your orders at Simply Swim. Please use code SC86243VK at the checkout. HOP ONLINE AND RAISE MONEY FOR DAVENTRY DOLPHINS SWIMMING CLUB! Have you heard about Easyfundraising yet? It's the easiest way to help raise money for Daventry Dolphins. If you already shop online with retailers such as Amazon, Next, Argos, John Lewis, Comet, iTunes, eBay or HMV, then we need you to sign up for free to raise money while you shop! So how does it work? You shop directly with the retailer as you would normally, but if you sign up to http://www.easyfundraising.org.uk/daventrydsc for free and use the links on the easyfundraising site to take you to the retailer, then a percentage of whatever you spend comes directly to us at no extra cost to yourself. So if you spend £100 with M&S online, we get £5 cashback from your purchase; £100 spent with Amazon raises £2.50 for us, £100 with WH Smith puts £2.00 in our pocket, and so on. easyfundraising have over 2,000 retailers on their site, and some of the donations can be as much as 15% of your purchase. This service is FREE to use, and what's more, joining easyfundraising will give you access to hundreds of exclusive discounts and voucher codes, so not only will you be helping us, you'll be saving money yourself. Sign up at http://www.easyfundraising.org.uk/daventrydsc and start making a difference...simply by shopping. HELP US RAISE VITAL FUNDS FOR THE CLUB! Are you one of the 6.4m people that use a search engine every day? 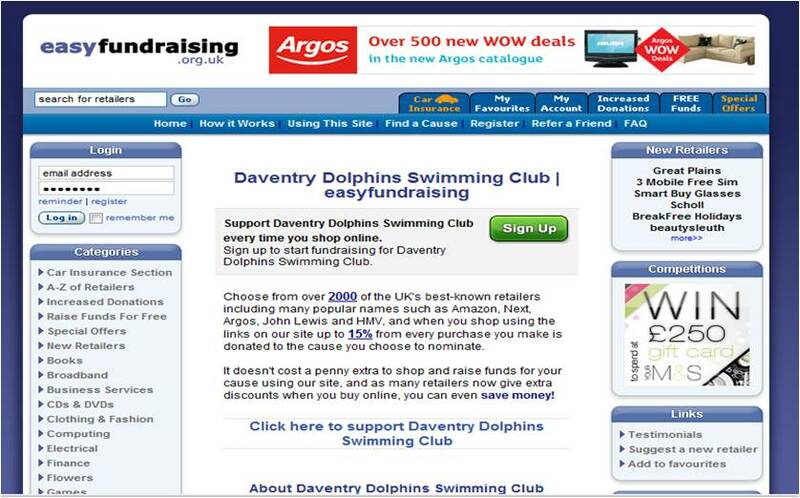 If so then why not raise money for Daventry Dolphins Swimming Club while you search? http://daventrydsc.easysearch.org.uk combines the results of several search engines such as Yahoo!, Bing and Ask to ensure you can always find what you're looking for. But the fantastic thing is that EVERY TIME you search, half a penny is raised for DAVENTRY DOLPHINS. That's right you don't even have to buy anything! Almost 18 million searches have been made using Easysearch and each one has raised money for good causes. So the next time you need to find something online, please use http://daventrydsc.easysearch.org.uk and raise money for the club with every search you make.